These four technology companies have all achieved great success. My personal favorites from a product standpoint are Apple, Intel and Google. For investors, however, “shares outstanding” do indeed matter. 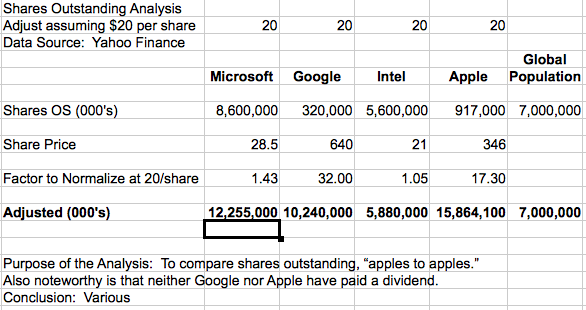 Given that neither Apple nor Google have ever paid a dividend, coupled with their near tax exempt income status due to massive stock option deductions, the following analysis could be germane. Some may argue with reason that sales and profits should be considered yet the purpose of this analysis is singular, to tune out everything except the number of mouths a company has to feed with respect to future dividends and capital appreciation. To simply ask the following question: How many shares would each firm have outstanding if the stock values of each were adjusted to $20 per share via a stock split. The answer for Apple is almost 16 billion, that is approx 2.3 shares for every person on the planet. Note: This is not a recommendation to purchase Intel nor sell the others but rather an attempt to simply state that the number of shares outstanding should indeed be incorporated into an analysis of any company.